Despite the sale to Mexico in 1951, certain SP operating practices are yet faithfully observed at centurys end. 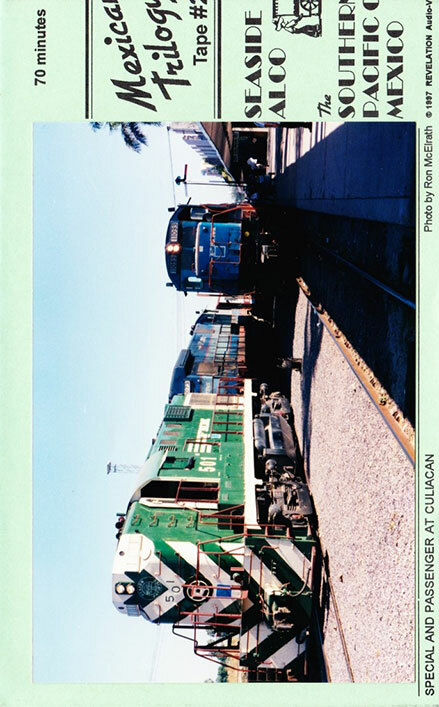 Journey over FCP's line from Sufragio south to Guadalajara, along with several branches plus NdeM routes to Los Reyes and Manzanillo. Alco RS-11 #501 (originally 1501) celebrates her 39th year in a fresh coat of green paint and yellow trim. In the company of a GE SUPER 7, we zip along the coastal plain and witness sunset over the Pacific. On the evening of November 7, 1996, partake in the annual "Day of the Railroader" festivities at Tepic! Thrill to the viaducts and blast through 35 tunnels (from the GE's walkway!) along this route completed in the 1920s through the challenging canyon region. At Guadalajara, sleeping cars and Pullman conductors are not quite memories. A variety of Alcos and MLWs, some in BC Rail paint, hold our interest. Alco #501 gets to strut her stuff on the Ameca branch, creating more than satisfactory plumes of exhaust. Ride the rural NdeM branch to Los Reyes, then the Manzanillo line whose 16 tunnels are being enlarged for double stack trains. In fact, work is in progress as we pass through T-14! Helper-assisted iron ore trains are passed on our way to the Pacific port of Manzanillo, concluding our middle volume of "MEXICO TRILOGY".